As we’ve said on a number of occasions, luck has been with us on Dash Landing, especially with the trades. We’d have a tough time naming a crew or even an individual that wasn’t great to have on site. John, Kyle and the KC gang, Greg Soper, Jon Harmer, Levi, Sam the mason, Josh our electrician, Lars the roofer, Randy the painter and a lot more. Pleasant, polite, knowledgeable, hardworking — we’d invite them all back for our next project in a heartbeat. How about our comrades at CMP, you ask? While these folks drove us to the brink of desperation (303 days! ), the crews, engineers and office people were always nothing but pleasant. They’d show up at the building site, shrug their shoulders, mutter something about Augusta and jump back in their trucks. It’s not like we had a lot of electricity options and the feeling was that we — collectively — were just trying to push a big bureaucracy along in an orderly fashion. All that luck came to an end today with our friends at Comcast. As part of the moving process, we went to Comcast’s local Brunswick office a few weeks ago to schedule the move from Flying Point Road to Dash Landing. Took a little juggling to get past some arcane “48 hour rule,” but things got worked out. As an added bonus, the rep told us to “bring our old DVR to the new house because we’d like to move you to Comcast’s newest DVR technology. The installer will take your old box and install the new one.” Wow. Thank you, Comcast! Tuesday afternoon, the installer showed up on schedule. A few technical problems, but nothing major. Where’s our new DVR? You know the one that you offered us? Get on the on-line Comcast chat. Get bounced around a few times. The rep tells not we’re not scheduled for one, but he’s going to escalate our call. 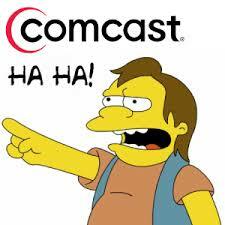 Someone will call us within 48 hours because we’re important to Comcast. Seventy-two hours later, no call. So apparently we’re not that important. As luck would have it, we were making our 1,000th trip to Home Depot today and decide to swing back by the local Comcast office. Asked them about the new DVR. But we just moved houses and you charged us a new installation fee? Why did you offer us one a week ago?